MCCAIN: Let me mention to you one more time, the earmarks and pork-barrel spending very quickly because, because, it is so important because it is not only gotten out of control, but it’s end up with members of Congress residing in federal prison cause it’s corrupting and it’s your money and they think it’s their’s. They think it’s their money, not yours. And we’ve had a Bridge to Nowhere, $233 million bridge in Alaska, which I’m glad, happy to say, this governor stood up against. As ThinkProgress has noted, when Palin ran for governor, she supported the project and defended it against “the spinmeisters” who wanted to turn it “into something that’s so negative.” When she finally redirected funds away from the bridge, she lamented the fact that Congress had “little interest in spending any more money” on the project. Why would the guy pick a person he's criticized in the past for earmarks? WASILLA, ALASKA -- For much of his long career in Washington, John McCain has been throwing darts at the special spending system known as earmarking, through which powerful members of Congress can deliver federal cash for pet projects back home with little or no public scrutiny. He's even gone so far as to publish "pork lists" detailing these financial favors. Three times in recent years, McCain's catalogs of "objectionable" spending have included earmarks for this small Alaska town, requested by its mayor at the time -- Sarah Palin. ... when Palin served as mayor of her hometown of Wasilla, outside Anchorage, she obtained about $27 million in federal "earmarks" during her last four years in office, according to the watchdog group Taxpayers for Common Sense. I see now why those who support McCain are called "McCainiacs." I saw this picture before but couldn't quite place my finger on the problem with it until now. The guy in the front row forgot his "Depends" and is sitting there sleeping in his urine soaked jeans. I think you're right! 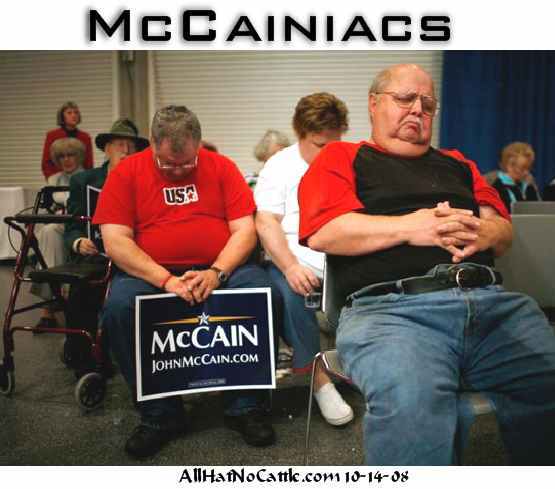 Maybe that's why it's called McCainiacs...they won't stop praying long enough to take a potty break! 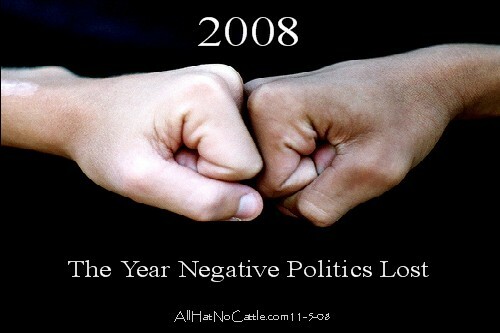 Has Sarah Palin ever knocked Alaska representative Don Young for his fondness for earmarks and such? Oh yeah, knock Mr. Obama, but what the stuff that goes on under your own nose, there, Sarah? Young has plenty of company in Congress when it comes to parlaying federal contracts and grants into campaign donations. But few have taken richer advantage of a controversial process called "earmarking." During his six years as chairman of the Transportation and Infrastructure Committee, Young transformed the massive 2005 highway spending bill by dramatically increasing the use of earmarks, which set aside billions in federal money for pet projects. With Young in charge, the number of earmarks more than tripled -- from 1,850 projects worth $9.35 billion in 1998 to 6,371 projects valued at $24.2 billion in 2005. Federal auditors have found that thousands of these new earmarks weren't priorities for state transportation officials. • Of the $6.5 million in contributions that Young collected -- $5.5 million for his campaign and $1 million for his leadership political action committee, or PAC -- about 85 percent came from people who didn't live in Alaska and couldn't vote for him. • While the number of donors who got earmarks is hard to determine, an analysis of Young's campaign finance reports show that beneficiaries of just seven earmarks with a total price of $259 million gave the veteran congressman at least $575,000. None of the projects was in Alaska. • As hundreds of lobbyists sought to influence the massive highway-spending bill from 2003 to 2005, Young accepted at least 20 trips aboard private aircraft provided by corporations currying favor with the powerful congressman. He also stayed at such luxury hotels and resorts as the posh Four Seasons hotel in Newport Beach, Calif., MGM's five-diamond Bellagio casino in Las Vegas and the Lodge and Ranch at Chama, N.M., which offers pricey hunting and fly-fishing excursions. Interesting difference in how the Republican candidates for president and vice president left Phoenix after their defeat. Palin left the Arizona Biltmore hotel Wednesday afternoon in a motorcade stretching more than a dozen vehicles, flanked by a dozen more cops on motorcycles. She was joined by some 18 family members and friends who had made the trip from Alaska to Phoenix to watch Election Night returns. In contrast, John McCain drove himself in his own gold Toyota Sequoia SUV -- with friend and Senate colleague Lindsey Graham riding shotgun -- from his condo in Phoenix to his secluded compound in Sedona for a few days of rest there.